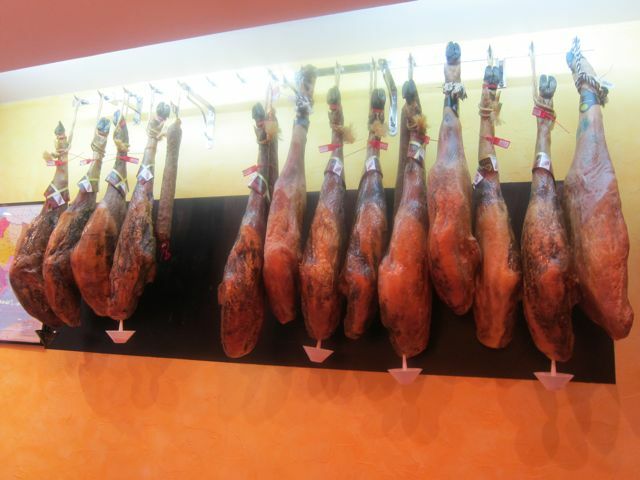 Jamón ibérico (Iberian ham), also known as pata negra (black leg) is a type of cured ham produced mostly in Spain, but also in some Portuguese regions where it is called presunto ibérico. 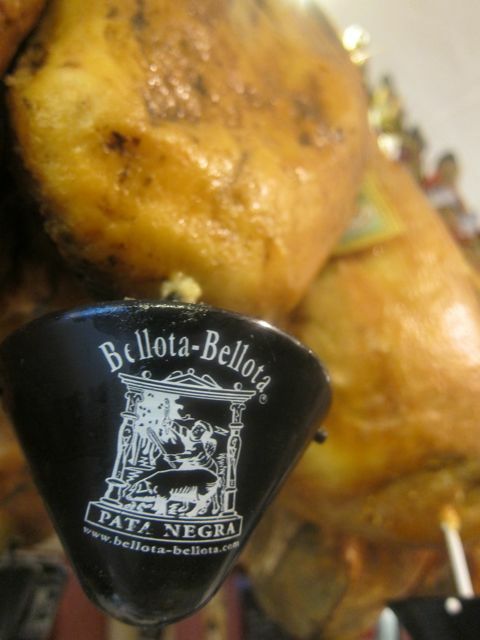 Pata negra is at least 75% black Iberian pig. The black pig lives primarily in the southwestern parts of Spain including Salamanca, Seville, Cordoba and Ciudad Real. The difference between the breeding of pata negra and other pigs is that piglets are fattened on barley and maize for several weeks before roaming on pasture to feed on grass and herbs, until the slaughtering time approaches. 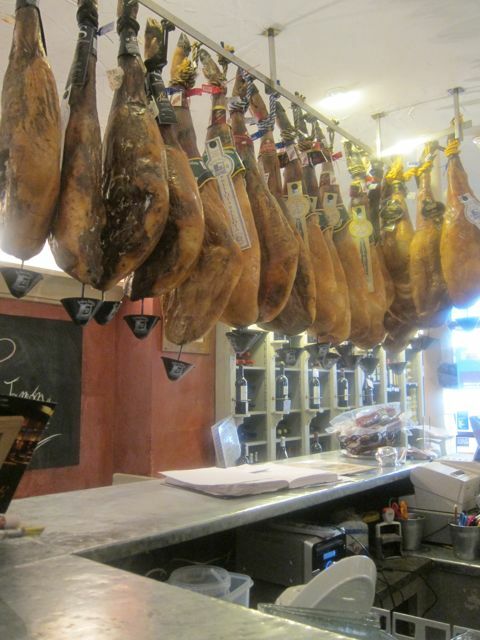 The hams from the slaughtered pigs are then salted, dried for 2 weeks, rinsed and then dried for another 4-6 weeks. The curing process takes at least 12 months, but they are best after 4 years. The hams are categorized and labelled according to the pigs’ diet. 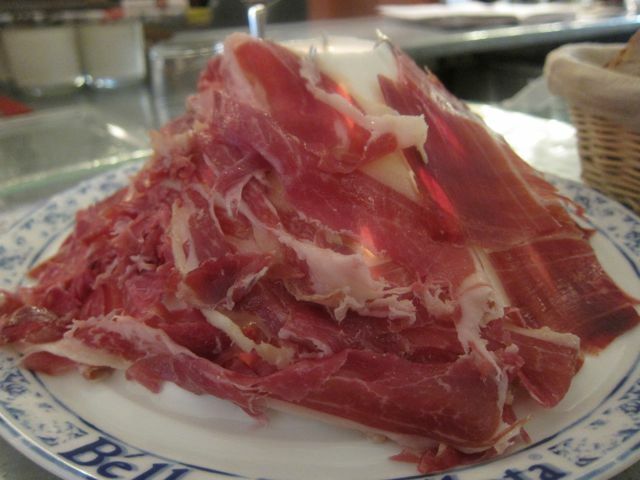 The finest jamón ibérico is called jamón ibérico de bellota (acorn) which eat only acorns. The term “pata negra” refers to the color of the pig’s nails black for the Black Iberian Pig (but otherwise white). 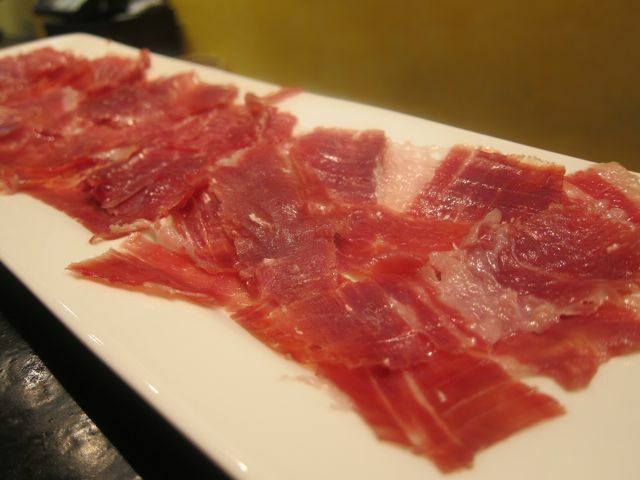 The pata negra tends to be cut in very thin slices for degustation. 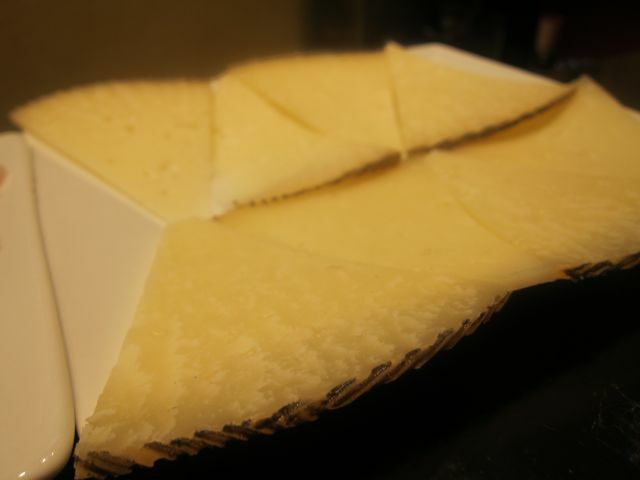 Bellota is prized both for their smooth texture and rich savory taste. The best I have had so far was in Spain, but in Paris there are definitely a few places where you can taste this magnificent delight. 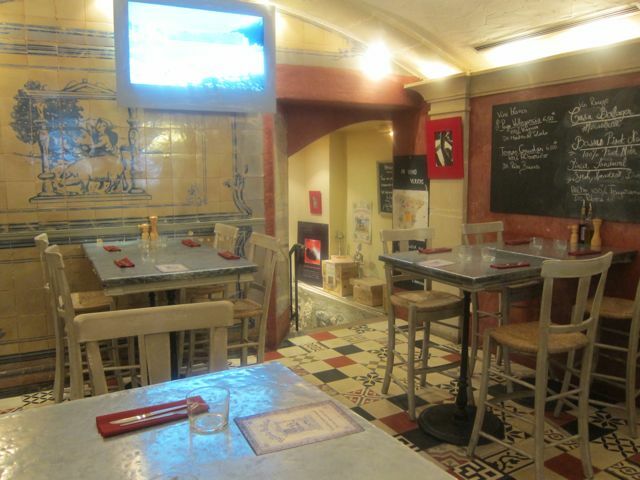 The first contender is called Bellota Bellota in the 7th arrondissement, a 10-minute walk from the Eiffel Tower. This small epicerie-restaurant serves great Spanish appetizers with wines by the glass (and bottle if you’re feeling adventurous). Their pata negra is very fine. I recommend the Bellota Bellota volcano which serves both lomo (tenderloin) and paleta (shoulder) which comes with a beautiful tomato sauce. 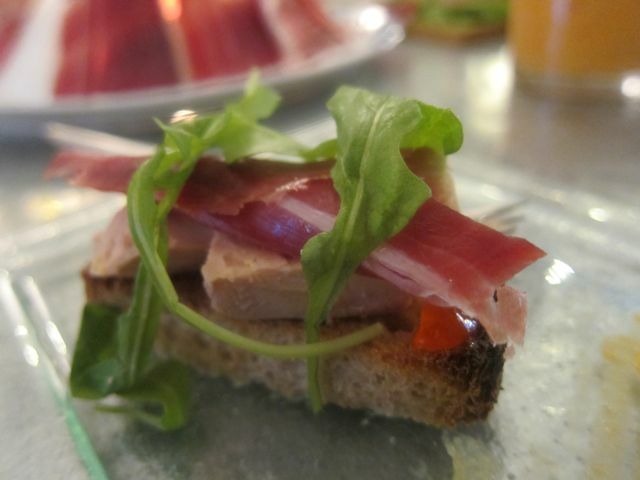 Obviously couldn’t resist the foie gras with lomo. Another contender, El Sol, is located on the main road near the Eiffel Tower but a much smaller shop owned by a Spanish from Extremadura. The staff was much more livelier and talkative while slicing the pata negra very thin. A beautiful thing to watch. 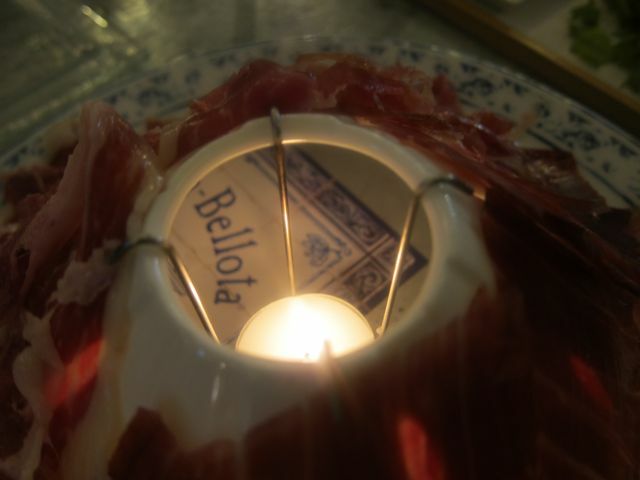 Their bellota ham and tomato sauce were equally as good and the manchego cheese was a good addition.